In the annexed Crimea, the Crimean Bridge was solemnly opened with the participation of Russian President Vladimir Putin. The head of the invader-state got behind the wheel of a truck "KAMAZ" and headed a column of trucks. Putin thanked the builders for their excellent work and noted that the construction work was completed ahead of schedule - it was originally planned that the car traffic will be launched in late 2018. A full motor traffic on the bridge across the Kerch Strait will be launched on May 16. 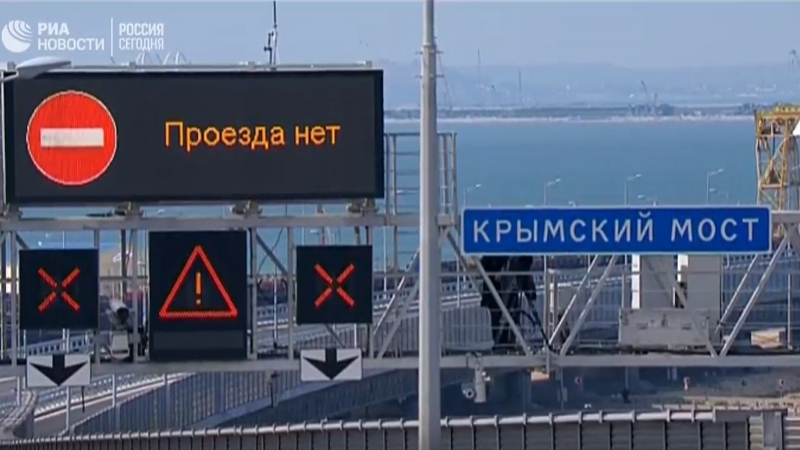 Reportedly, the Prosecutor's Office of the Autonomous Republic of Crimea conducts pre-trial investigation in connection with violation of the rules of environmental safety in the construction of a transport crossing through the Kerch Strait. According to the Prosecutor's Office, the pre-trial investigation is conducted jointly with the Investigation Department of the Main Directorate of the National Police in Crimea and Sevastopol. The Prosecutor's Office noted that the estimated losses caused to the environment of the Black and Azov Seas will amount to no less than UAH 10 billion (more than 382 million USD). Earlier, the Russian opposition politician Konstantin Borovoi said that after the de-occupation of the Crimea, the Kerch bridge would have to be demolished. Also, the Russian opposition politician stressed that the funds spent on this bridge will never pay off.